The Agricultural Commissioner (CAC) gathers and compiles data on the acreage, yield, production and value of crops grown in Ventura County in order to produce an annual Crop and Livestock Report. Crop information data is requested from all producers, packers, and processors. 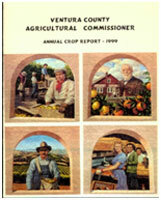 The report documents the total gross value of the crops produced in Ventura County. Data contained in the report also includes: the top ten crops in value for a given year; compilations of various crop groupings such as Fruit and Nut Crops, Vegetable Crops, Nursery Stock and Cut Flowers, Field Crops, Livestock and Poultry, Apiary Products, Timber and Sustainable Agriculture; and historic values and trends. Crop report information is used by the agricultural industry in areas such as production planning, marketing, loan credit, research and education.